In 2017, Denny Hamlin out the bumper to Chase Elliott at Martinsville Speedway. At that time, both drivers were racing for a championship position. Elliott ended up in the wall and the two traded words on the race track after the race. Two weeks later, Chase Elliott returned the favor at ISM Raceway. That was a retaliation from the incident at Martinsville Speedway. A NASCAR driver feud was born. 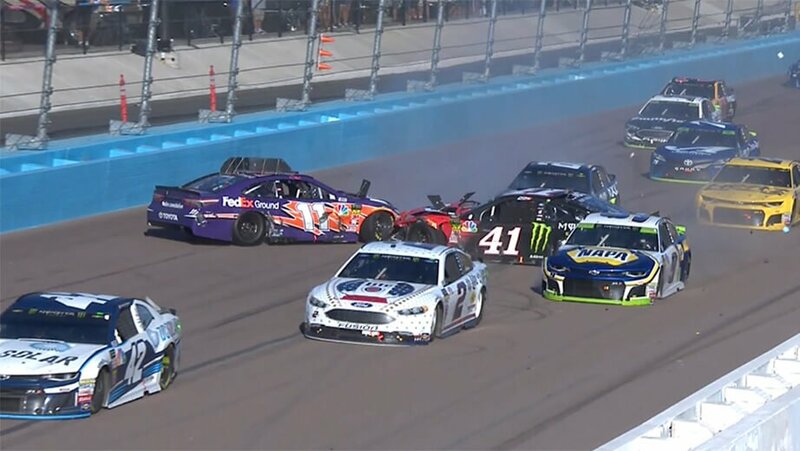 On Sunday, Denny Hamlin was going for the race lead at ISM Raceway. On a restart with just a 49 laps remaining, Hamlin found pace on the apron as others had all day. Hamlin, Jones and both Busch brothers were four wide for the lead off turn two. Hamlin had his nose in front. But, he was unaware that Kurt Busch had a run coming on the top. Hamlin got loose during the transition from the apron to the race track and he used the entirety of the track surface to save it. He chased it up the banking and the #11 banged doors with Kurt Busch in the #41, pushing him out of the groove and into the outside wall. Busch became a pinball at the front of the field. He bounced between the wall and Hamlin until they ran out of room completely and something had to give. “He just ran us right in the wall and never lifted, the #11,” Kurt Busch said over the radio. Busch got into the right rear corner panel of Hamlin and hooked him down the backstretch. Hamlin was sideways in the middle of the track with the field looking for a way by.